Noronha is a native of Madagascar. Some taxonomists are of the view that this plant originated in Srilanka and spread to other parts of the world from there. 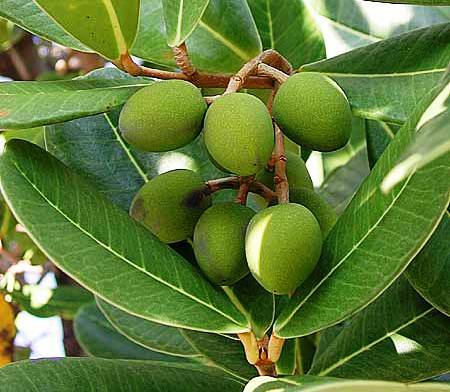 Though it bears edible fruits, still the plant is cultivated mainly as a specimen or ornamental plant in many subtropical and tropical countries. At Hawaii, they feel and noronha has become invasive in some parts. Trees to 15 m tall, bark smooth; branches stout, terete, the terminal twigs flattened. Leaves elliptical or obovate, upto 16 cm long, 10 cm wide, entire or emarginate, mucronulate, basally narrowed or obtuse, above blue green with contrasting pinnate veins which anastomose to form a continuous vein ca. 5 mm from the revolute margin, beneath yellow green, minutely punctate, the lateral venation obscure, petiole stout, ca. 5 mm thick, 10-15 mm long, light brown and contrasting with the color of the leaves and stems. Inflorescences small racemes or panicles to 8 cm long, lateral on horizontal or descending twigs; pedicels and peduncle stout, green, subtended by minute deltoid or obtuse, deciduous bracts; pedicels 7-15 mm long, the base of the flower with 2 opposite, minute, appressed bracteoles. Flowers self-fertile, 4-merous; calyx lobes similar, obtuse, ciliolate, ca. 1.5 mm long; corolla yellow, drying dark, thick and fleshy, the tube obscure, the limb lobed over halfway, the limb and lobes cuculate, globose, 6-7 mm across, the interior base flat and the coronule scarcely evident; stamens subsessile, inserted on the corolla tube, the anthers green, becoming dark brown after anthesis, dorsiventrally compressed, appressed to the ovary, broadly elliptical with a strong lateral sulcus, ca. 2 mm long, opening laterally; ovary green, conical, 2-3 mm long, smooth, glabrous, 2-locular with 2 ovules in each locule, the stigma white, glistening, 2-lobed, sessile on the ovary apex, the stigma and anther tips at the same level just above the floor of the corolla. Fruits globose to turbinate, apiculate, ca. 20 mm long, drying hard, dark brown, slightly rough. Seed pyriform, dark russet, 10-12 mm long, only partly filling the abortive locule, the cotyledons unequal. 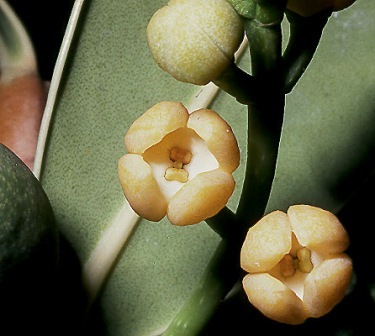 The fruits are edible with sweet pulp. However, the pulp, that surrounds the seed is not much. The fruits are eaten but not offered for sale anywhere. 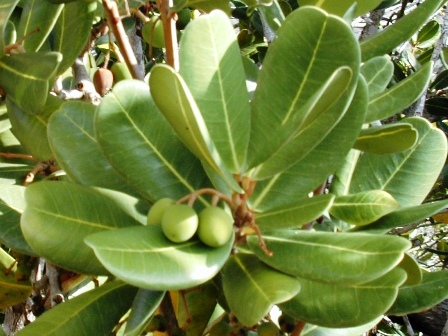 The tree of noronha is planted in gardens as a specimen or ornamental tree. Trees planted in group also make a very efficient wind break. Noronha is very tough in coastal and seaside locations. 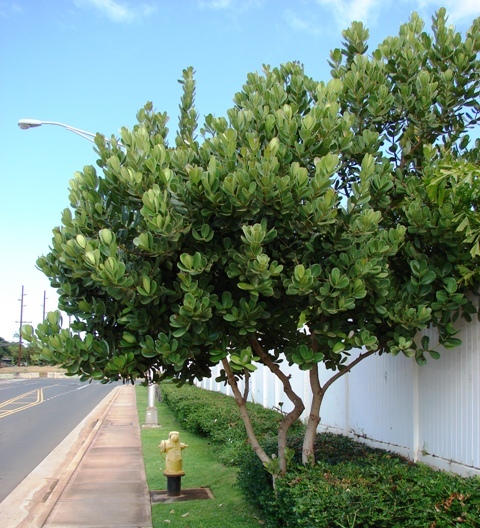 As an ornamental plant, it has also been successfully tested in urban areas where air pollution, poor drainage, compacted soil and/or drought are common. It grows in part shade and in full sun. Soil tolerance is well-drained, acidic or alkaline clay, loam or sand. It has high drought tolerance, high aerosol salt tolerance and moderate soil salt tolerance. New plants can be raised from seed as well as from cuttings. Cultivation of noronha does not require any special kill.